Recently there has been a dramatic increase in the occurrence of bacterial wilt, especially in pumpkin and squash. 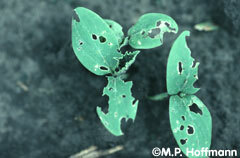 Initial symptoms of wilt are pale, wilted sections of leaves that are often associated with feeding injury (Figure 1). 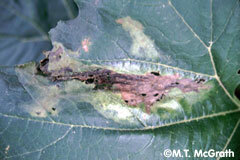 Symptoms of bacterial wilt progress from localized leaf symptoms to collapse of individual vines and eventually to plant death (Figure 2). The bacterium causing this disease (Erwinia tracheiphila) cannot be controlled directly with pesticides, therefore, management practices have targeted the insects that harbor and vector the pathogen, which are the striped and spotted cucumber beetles (Figures 3 and 4). 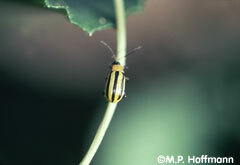 Control is complicated because the presence of beetles alone is not indicative of an impending wilt epidemic (Figure 5). 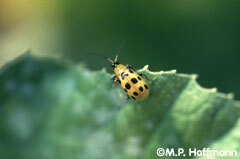 In the absence of the pathogen, a much higher beetle density can be tolerated by the crop. However, if growers wait until disease symptoms occur to treat the beetle vectors, subsequent control of wilt is erratic. Information on varietal susceptibility and recent registration of the systemic nitroguanidine insecticide Admire 2F (imidacloprid, Bayer Corp.) provide new tools for managing wilt. Below is a list of management steps followed by information on these practices. A paragraph on managing wilt organically is after the description of conventional practices. 1. Select less susceptible varieties. 2. Apply Admire at planting. 3. Scout weekly for cucumber beetles and wilt symptoms. 4. Foliar insecticides may be needed if beetle counts are above 1 beetle/plant, wilt is developing, and the variety is highly susceptible. 1. Differences among cucurbit crop types and among varieties in attractiveness to beetles and in occurrence of wilt were detected through research conducted recently on Long Island. This information will be helpful for tailoring management programs. Less susceptible varieties should be chosen when possible; else a good insecticide program should be implemented. One important finding was that attractiveness to beetles was not always related to wilt susceptibility. For example, although fewer beetles per plant were observed in cucumber than in most other cucurbit crop types, and little feeding injury was observed, a higher percentage of cucumber plants developed wilt. Muskmelon had similarly low beetle densities but less wilt than cucumber. Compared to cucumber, zucchini was more attractive to beetles and less susceptible to wilt. The gourd Turk's Turban (Cucurbita maxima) was very attractive to beetles and was severely affected by wilt, differing substantially from Pear Bicolored (Cucurbita pepo). This documents an important difference between these species that most likely extends to other gourds. Initial symptoms of wilt were first seen 13 and 19 days after cucumber beetles were first seen in 2000 and 1999, respectively. In the absence of insecticide treatment, all Turk's Turban plants died before producing fruit while about 25% of the Pear Bicolored plants died by late August. Differences in wilt occurrence were also detected among pumpkin varieties. This was not related to attractiveness to cucumber beetles or to damage from their feeding, which suggests these varieties differ in their susceptibility to wilt. A high percentage of Merlin plants developed severe wilt (at least 50% of the plant affected) by late August in both years (89-97%). Magic Lantern was also severely affected in 2000 when insect and disease pressure was higher than in 1999 (98% in 2000 versus 22% in 1999). These varieties did not have more beetles per plant or more feeding injury than Harvest Moon and Howden. Percentage of plants of these varieties that were severely wilted was 3% and 13% in 1999 and 53% and 58% in 2000, respectively. The more susceptible varieties have powdery mildew resistance (PMR). Fortunately there does not appear to be a general correlation between wilt susceptibility and PMR as the PMR muskmelon and yellow summer squash varieties examined in this study (Eclipse, Athena, and Sunray) were not more susceptible to wilt than the other varieties examined. Waltham Butternut (C. moschata) had fewer beetles and less feeding damage than other winter squash varieties, and it was the last to develop wilt symptoms, which were not seen until 15 Aug 2000. It was less susceptible than Golden Delicious or Blue Hubbard; Table Ace and Burgess Buttercup were intermediate. Winter squashes Golden Delicious and Blue Hubbard had higher beetle densities, more feeding injury and higher incidence of wilt than Waltham Butternut and Table Ace. Watermelon is considered not susceptible to bacterial wilt. It is also less attractive to beetles than most other cucurbit crops. The pickling cucumber County Fair, which is reported to be wilt resistant, was substantially less susceptible to wilt than the other two varieties examined (7% wilted versus all Dasher II and Calypso plants wilted by 22 Aug). Similar to pumpkin, this was not due to differences in beetle attractiveness as there were no significant differences among cucumber varieties in number of beetles/plant or amount of feeding damage. It is suspected that the pathogen varies regionally, however, which could result in regional differences in varietal response. Therefore, it is possible that some of the results obtained on Long Island may not extend to other areas. Additional research is needed. 2. Admire has the potential to improve and simplify early season control of cucumber beetles and thus wilt. Cotyledons are highly attractive to cucumber beetles (Figure 6) and susceptibility to wilt is greatest when plants are young; however, it is challenging to protect cucurbit crops with insecticides applied to leaves because plants do not always emerge at the same time in a field, young plants grow quickly necessitating frequent applications to protect new leaves, and the wide row spacing typical of vining cucurbit crop types means a lot of spray material will land on soil if nozzles between rows are not blocked. In contrast with other insecticides labeled for this pest, Admire can be applied to soil before or after seeding or transplanting which enables product to be in leaf tissue when an early invasion of beetles occurs. Additionally, it has a relatively safe toxicological profile. The recommended rate when applying Admire to the planted row is 1.1 fl. oz./1000 feet of row. The estimated cost/A of an Admire application is $33.38 for a crop planted at 6-ft row spacing based on a price of $535/gal. This is more expensive than an application of Sevin XLR at 1 qt/A ($6.35/A) or Asana XL at 5.8  9.6 fl. oz./A ($7.11 - $11.78); however, more than 1 application of Sevin or Asana most likely will be needed to achieve the same level of control as one application of Admire. A less expensive option is to apply Admire as a drench to seedlings at least 1 day before transplanting. The recommended rate is 0.02 ml/plant (20 ml or 0.68 fl. oz. per 1000 seedlings; 1 fl. oz. per 1480 seedlings). It is important to measure accurately because a higher rate can cause phytotoxicity. Disposable, needle-less syringes are a great tool for measuring small amounts. It is important to get Admire into the soil to avoid photochemical breakdown; this can be accomplished by placing it in the furrow or irrigating it in. In experiments conducted with Merlin pumpkin and Dasher II cucumber on Long Island in 2000, there were fewer wilted plants where Admire was applied in the furrow with the seed than where Admire was applied over the row after seeding (the entire experiment was irrigated beginning a few hours after applying Admire). These treatments did not differ significantly from Sevin applied weekly beginning 11 days after seeding. Treating seed is not expected to be as effective as soil applications because the insecticide will be lost if the seed coat is pushed out of the soil by the seedling during germination. 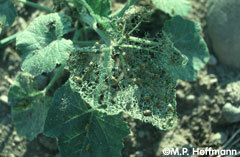 An action threshold for foliar insecticide treatment of 1 beetle/plant has been recommended for cucurbits. In an experiment conducted on Long Island in 1999, this threshold proved to be acceptable for Harvest Moon pumpkin, which had less than 1 beetle/plant until the last assessment and had only 3% of plants become affected by wilt. In 2000, threshold was reached for all pumpkin varieties on all 4 sampling dates (22 June  11 July); and wilt incidence was very high (53-98%) by late August. However, the threshold was too high for Magic Lantern and Merlin, which had an unacceptably high incidence of wilt (22 and 89%) despite not reaching this threshold in 1999. Practices for managing bacterial wilt organically include selection of less susceptible varieties, yellow sticky cup traps, and foliar application of kaolin clay (Surround WP). Information on differences in susceptibility among crops and varieties is described in the first section of this article. Sticky cup traps are yellow cups with tangle trap. They are stapled to wooden stakes and typically placed about every 20 feet along the row throughout small fields or just in the outer rows of large fields. Traps will stop working when they get covered with dust; thus they may need to be replaced once. Surround repels cucumber beetles. Replicated trials have not been conducted to evaluate Surround, partly because it is more difficult to demonstrate repellency than pesticidal activity in small plots as the beetles are less likely to leave a research field where there are untreated control plots than a production field that is entirely treated. The manufacturer based the labeling for cucumber beetles on anecdotal reports of good control. Cost is $12/A for Surround applied at 20 lb/A. Another option is row covers. They are very expensive: $300 - 400/A, and thus usually only feasible for high value crops. Covers provide only about 3  4 weeks of protection as they need to be removed by the start of flowering so that bees can pollinate. Plants will be more lush and internodes will be lengthened compared to plants not grown under covers. Earliness is an added benefit of row covers. Trap cropping, which involves planting a more susceptible variety next to a crop, is a potential management practice under investigation.